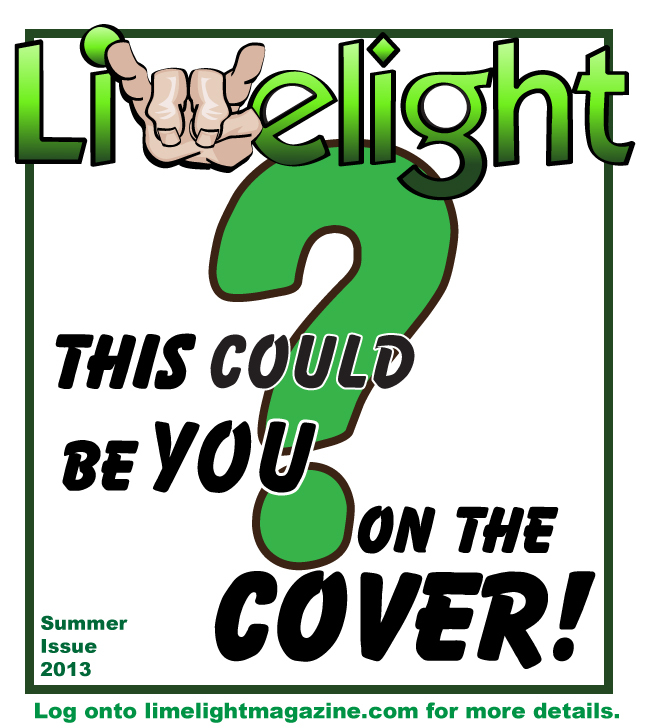 Ever want to be on the cover of Limelight Magazine? Well, here’s your chance to make it happen with our “We Got You Covered” Competition that will take place at 3065 Live in East Wareham on Saturday, June 8, 2013. All proceeds from the event will go toward covering the production costs of the summer issue of Limelight Magazine. Click HERE to read the official rules and to get an entry form. If there are any issues with the link, please e-mail us at limelightmagazine@gmail.com and we’ll gladly send the info to you as a PDF or Word document. A summary of the contest appears below. All musicians wishing to register for the “We Got You Covered” Competition must read and accept the following rules and regulations before completing the registration form. Please note there is NO entry fee for this contest, but we need you to submit your completed registration form and a CD or MP3 by Friday, May 17, 2013, at 5 p.m. EST. CDs can be mailed to Limelight Magazine, P.O. Box 79263, Dartmouth, MA 02747, while MP3s can be e-mailed to limelightmagazine@gmail.com. 1. This contest is for any band or solo musician from New England performing any genre of original music who has not previously appeared on the cover of Limelight Magazine. 2. After the co-owners of Limelight Magazine have reviewed the entry materials, six to eight finalists will be selected and contacted on Saturday, May 18, 2013. 3. The finalists will perform at 3065 Live, located at 3065 Cranberry Highway in East Wareham, MA, on June 8, 2013. Each band will have 20 minutes to perform. (For every minute exceeding the 20 minute limit, the band will be penalized 5 points from their total score.) All musicians should be at the venue at 5:30 p.m. to draw their time slots. We ask that everyone stays to support the other musicians. 4. The songs must not include profanity. All songs and performances must be family-friendly. Only one cover song is permitted. 5. All competing bands are strongly encouraged to partake in ticket sales for the advantage of crowd applause, which will be one of the criteria for which judging is based. 6. There is no limit to the number of bands who wish to apply for the competition, but no more than eight will be chosen. 7. Each competing band receives two complementary tickets in order to gain awareness and build their fan-base for the show. All other tickets will be full price at the rate of $10 general admission. 8. Judging is done on a 1-10 scale by four qualified judges. The criteria on which the bands will be judged are explained below. The final criteria, however, is crowd reaction which is done on a 1-20 scale. How loud can you make the venue? BRING YOUR FANS!!! 9. The winner of this contest will be asked to play an encore after the final judgment for 10 minutes. Please have a second set prepared in the event of victory. 10. The winner is required to be available for a photo shoot with music photographer Kristen Pierson (www.rok-pix.com) between June 12 to June 16 and must be able to travel to and within the state of Rhode Island. Limelight Magazine will provide the winner a hi-resolution JPEG of the cover in which they appear when the issue is published. If you are unavailable between the dates listed above, you will be disqualified and another winner will be selected. 11. A backline drum kit and vocal mics will be provided. Bands must provide their own instruments, guitar and bass amps, and pedal effects. Drummers must supply their own snare and cymbals. Vocalists may supply their own mic if desired.